See how quick and easy our delicious Angel Lush is to make. Our step-by-step instructional video breaks it all down for you. You'll be able to wow your next crowd with the impressive looks and exquisite tastes of our Angel Lush, no problem. Stack cake layers on plate, filling layers and topping dessert with pudding mixture. Omit cake. Prepare pudding mixture as directed. Refrigerate several hours or until chilled. Spoon into dessert dishes just before serving; top with strawberries. 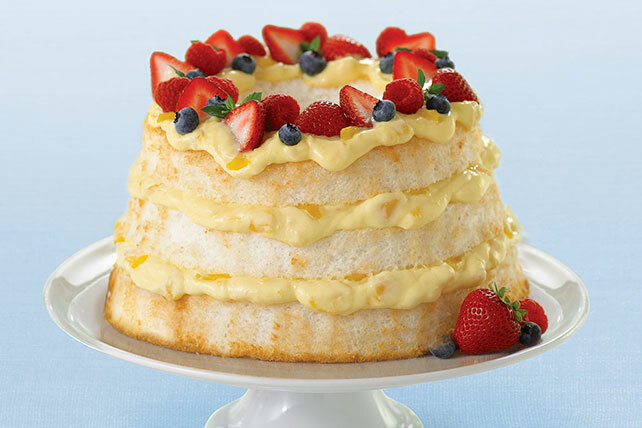 Use a serrated knife and gentle sawing motion to easily cut the angel food cake as directed. Prepare using COOL WHIP Sugar Free Whipped Topping. The fruit in this heavenly low-fat dessert is rich in vitamin C.